There is a huge pile of research reports and studies on my desk how digitization will change the way we do business. And I am sure there are similar piles in many managers’ offices. But what good are the best reports if you are unable to move the transformation forward? Those that are succeeding in moving along their digital transformation have two things in common: one, they not only understand what digital transformation means, they also know that it means a fundamental change for the whole company. And two, they ensure that they have the right resources with the right expertise to transform their corporate culture to meet the upcoming challenges. Digital transformation needs to driven by the CEO. Not your Head of IT. Not your Head of Sales. Not your Head of Something Something. It needs to be one of the top strategic priorities for the whole company driven from the top down. Digital transformation is not walking down a straight path. You will need to be open for new business models. For new ways of implementing products and services. And your corporate culture will need to allow failure. Digital transformation can be driven an internal facilitator like a Chief Digital Officer or even be outsourced into a new venture that can work without any “analog”disruption from the organization in form of resistance or doubts. But whatever way is chosen at the end of you will need a leader. Digital transformation needs a leader who has a strong project management background, who is a multitasker, open to try new things. You will need someone who is impatient, a fast thinker , who plays well with others and is able to influence change within the culture of the board and with it the rest of the company. And you will need someone who is a strong communicator. Someone who can combine the “old” with the “new”. That is why it is imperative for all organizations to start understanding what digital transformation means for their business and how the digital competencies of new and existing directors will fit emerging strategies. And it is the CEO’s task to ensure that this journey is started on the right path. Big news from Google this week. Alphabet. Their new holding company. And a great name at that. Suggesting anything and everything and many new ideas and multitude of opportunties. Larry Page letter to staff, announcing Alphabet, has some pretty good, quotable quotes. Something any CEO or leader should take note of as they are relevant for any business that wants to be successful. If you do not allow for genuine, contrarian ideas to be developed and heard in your company you are crushing innovation. Companies that have a true desire to keep innovating and investing in weird, amazing ideas are sure to be at the forefront of success. No one wants to end up being the next Blockbuster, Netscape or Kodak. Google is disrupting itself with Alphabet. And a clever move it is. The restructuring allows Google to be agile (something the investors have been waiting for). Alphabet gives Google the flexibility to shift businesses. Not only under new umbrellas but also under new CEOs who may offer better leadership. for attracting and retaining talent. And we must not forget it allows for strong employer branding. A smart move. Google may be a tech giant but at the end of the day it is all about your clients and your employees. And a little marketing side note: Is it smart to re-organize one of the most recognizable brands on the planet? Sure. 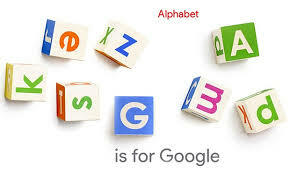 In creating Alphabet, Google is following powerful trend in corporate branding just like Apple or GE. And having a complete house of strong brands makes for a strong catalyst for innovation. It’s been a while since my last blog – summer is turning out to be busier than I thought! Russell Reynolds Associates 2012 Study of Digital Directors did catch my eye this month though. In today’s world, the CEO should also be the chief digital visionary in order to be able to lead the company’s digital transformation. And if this is not yet the case, companies – large and small – definitely need to start building their digital capabilities in order to remain competitive in this ever increasing technological environment. It was not surprising to read that almost all of the “highly digital” boards were in the U.S, with only two in Europe and none in Asia. Technology is creating new ecosystems and opportunities. And these opportunities also demand the need for thoughtful investments. So in order to fully take adavantage of what our new digital world has to offer, CEOs and management boards need to start to adapt. It’s time for management to become digital visionaries!